Curfews, roadblocks, checkpoints on highways leading to Al Hoceima in northeastern Morocco; neighborhoods encircled by military trucks; police attacking protesters; mass arrests; activists abducted off the streets. Since May 26, the first day of Ramadan, the city of Al Hoceima has seen continuous tumult, culminating with a day of bloody clashes on June 26, in what is now being called the Black Eid of 2017. Tensions had been running high in the Rif region, with ongoing protests since October, when a young fish vendor died at the hands of the police, crushed to death in a trash compactor as he tried to retrieve his confiscated merchandise. A truce of sorts had been negotiated in mid-May, when a ministerial delegation arrived in the city of Al Hoceima promising various development projects. The imam never completed his khutba. Zafzafi gave his own sermon to a crowd gathered outside the mosque. Street battles broke out between protesters and security forces, as the latter tried to arrest Zafzafi and his entourage for “hindering…freedom of worship.” Protests and sit-ins soon spread across the north and to major cities in central Morocco. Thousands marched across the country, chanting, “Rest in peace Abdelkrim, we will continue your struggle!” On the following Monday morning, the interior ministry announced that Zafzafi and dozens of activists, artists, and journalists had been arrested and taken south. Just a decade ago, thousands marching nationwide waving pan-Berber flags would have been hard to imagine. My grandmother—Yema, as we called her (“mother” in the Tarifit language of northern Morocco)—came into this world at the same time as the Rif Republic. Her father, M’Hamed, and mother, Tahera, were both born in the late 1800s in Ajdir, a village just south of the port town of Al Hoceima. Both were members of the Aït Ouriaghel tribe, which produced Abdelkrim, the founder of the Rif Republic, and M’Hamed would go on to become a confidant of the Riffian leader. In their youth, my great-grandparents would periodically decamp from Ajdir to Tangier (300 kilometers west), when violence—between tribes or against the Spanish—erupted, and would return when the situation calmed down. My grandmother was thus born in the kasbah of Tangier in 1922. Her mother had arrived in Tangier in 1910, fleeing marauding Spanish troops. But when Abdelkrim declared an independent republic in 1923, Tahera, and her 9-month-old daughter returned to the Rif. The Spanish have been present in northern Morocco since the conquest of Melilla in 1497. The Riffians had risen up against Spanish rule in 1893 and 1909, but with little success. But then Abdelkrim burst onto the scene. The scion of a prominent Riffian jurist, and fluent in Spanish, Arabic, and Tarifit, Abdelkrim was working as a journalist for La Telegrama del Rif in Melilla when he decided to lead his Aït Ouriaghel tribe in a revolt against the Spanish. Che Guevara and Mao Zedong would hail Abdelkrim as a Third World revolutionary. On July 22 1921, in an epic battle, Abdelkrim’s fighters inflicted a crushing defeat on the forces of King Alfonso XIII, killing 13,000 Spanish troops and regaining the northeast from Spain. The Battle of Annoual would become etched in the annals of military history, a stunning success, signaling the birth of modern guerrilla warfare. Che Guevara and Mao Zedong would hail Abdelkrim as a Third World revolutionary, and it’s said that Ho Chi Minh’s 1954 defeat of the French at Dien Bien Phu was inspired by Annoual. In February 1923, Abdelkrim declared the Republic of the Rif (Jumhuriyat al-Rif), a Berber state with its capital in Ajdir, extending from the outskirts of Tangier to the suburbs of Melilla. Yema and Tahera returned to Ajdir. Women sang and ululated as Spanish prisoners were paraded through the streets. The red and white Riffian flag fluttered above buildings. Well-wishers went to see Abdelkrim at “L’Oficina,” his new headquarters; the women who got to meet him said he had kind eyes and beautiful, creamy hands. Yema’s father, linked by kin to the president, brought his family back home to witness history. The 500,000 Tarifit speakers of northern Morocco, long maligned by both Europeans and Arabs as savages and barbarians (the name Berber derives from Greek bárbaros, and the Arabic word barabira also means “barbarians”), now had their own country, with an army and even a currency (the Riffian). Inspired by Ataturk of Turkey, Abdelkrim consolidated the Rif’s tribes into a nation, building a road system linking different areas, a bureaucracy with a three-tier tax system, and a national assembly. He would, from memory, dictate a 40-article Constitution to his scribes. According to our elders, after the Battle of Annoual, the Rif was the only corner of the Muslim world not under colonial rule. Abdelkrim was wildly popular throughout the Arab world, and as far away as Delhi. Muslims were captivated by this underdog warrior, who spoke of pan-Islamic solidarity and traced his ancestry to Omar ibn Kattab, a senior companion of the Prophet. 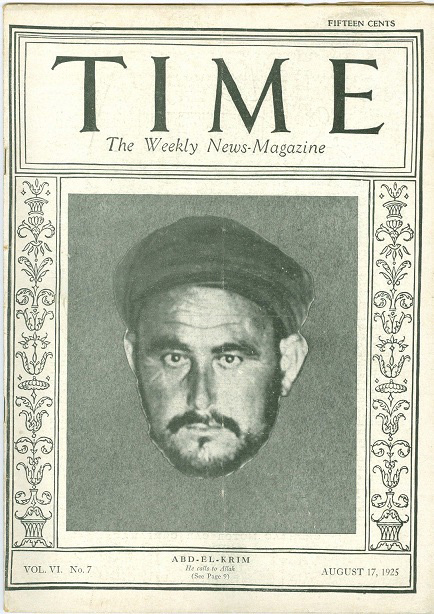 So was the European left, which were charmed by this Spanish-speaking Moor who refused to conquer Melilla, saying he was “anti-imperialist and not anti-Spanish.” Abdelkrim even riveted the American public; the turbaned revolutionary was Time magazine’s “Man of the Year” in 1925. Yet for all his appeals to Wilsonian principles, Abdelkrim could not get President Coolidge to extend his support. The Great Powers would not recognize the Rif Republic. The commander in chief of French forces in Morocco, Philippe Pétain, feared an independent Rif Republic would expand southward and threaten French Morocco, where he ruled through a puppet sultan. And so in 1925 France and Spain joined forces against the newborn republic. That’s when M’Hamed sent his wife and daughter back to the International Zone of Tangier. King Alfonso XIII directed his military leaders—one of whom was a young colonel named Francisco Franco—to use poison and nerve gas. The aim, according to the monarch, was clear: “the extermination, like that of malicious beasts, of the Beni Urriaghels and the tribes who are closest to Abdel Karim.” The Riffians were massively outgunned and outmanned, and in May 1926, Abdelkrim surrendered to the French. “I surrender,” he is said to have said, “so that my people continue to exist.” Three-year-old Yema and her mother would be safely ensconced in the kasbah of Tangier, surrounded by other members of the Ouriaghel tribe, when word arrived of Abdelkrim’s surrender and then of her father’s death. The French exiled the leader and his family to the island of Réunion in the Indian Ocean, though he eventually settled in Cairo, where he died in 1963. Two of Yema’s cousins were also dispatched to Réunion. Franco would go on to consolidate his grip over northern Morocco, later recruiting thousands of young Riffian men to fight Republicans in Spain’s civil war. When I was growing up in the 1980s, I remember my grandmother and her cohorts telling stories about Abdelkrim’s exile: which cousin had gone off to Réunion, who had settled in Cairo, who had ended up in Madrid or Barcelona; the time, in Ajdir, when Tahera had fired a rifle at intruders from a rival clan, striking a man in the leg. Then the younger women would get up and do impersonations: withering imitations of the portly Spanish nun who used to teach them Spanish as children, the snobbish young bride whose behind happened to stick out just like her mother’s, and so on. My grandmother would pick up the round bendir drum and lead off, her fingertips tapping a buzzing sound; the others would join in with their hand drums. The percussion would soften, and either she or Khadouj (In Tarifit, Arabic names are given an affectionate “oush/ouj” ending: Khadija becomes Khadouj, Amina becomes Minoush) would begin a mawal. Yema sang beautifully, women’s songs from the Djbala and Rif mountains. One of her favorites, about war and one-sided love, begins with gunpowder exploding on the hills of Chefchaoun, where the Riffians had done battle with the Spanish. “I cry for the dead, for the wounded can heal,” goes one verse. A black-and-white portrait hanging in my grandparents’ living room shows Yema in her teens, circa 1938: eyelashes raised with kohl, black hair braided in two long tresses and short sidelocks, with a centipede-like tattoo—the marking of the Aït Ouriaghel, the largest tribe in the Rif—crawling down her chin. Back then, girls from the Rif wore their hair in braids and short sidelocks. Yema never went to school. After her father’s death in the early 1930s, she had to help Tahera take care of the three young boys. She would cook dishes from the Rif for them—majaha, turda, and zambo. The boys had shaven heads, except for a thin braid going down their back, which they had to cut if they wanted to attend the nearby escuela Alfonso XIII. In Aïn Hayani, the little village near Merqala Beach, Yema met my grandfather Hamadi (we called him Vava, “father” in Tarifit), also of the Ouriaghel tribe, who had arrived in Tangier as a small boy in 1922. After World War II, Tangier returned to being an International Zone, ruled by a committee of eight Western powers and a mixed court. Moroccans were until 1960 restricted to the native zones—the Medina, M’Salla, Dradeb, and Aïn Hayani. Merqala Beach was one area where Europeans and Americans interacted with the natives. The cove was located at the foot of the “English Mountain,” so-called because that was where British and American expats had lived for centuries. At sunset, when the “Nazarenes” left, Yema and her friends—housewives, wheat-sellers, and cooks who worked for the foreigners up the hill—would tuck their caftans into their waistbands and step into the rock-strewn water, looking for seaweed (a good skin exfoliator) and smooth stones for prayer ablutions. The European and Moroccan women rarely mixed, but one woman from the Café Miri, where the foreigners sat and smoked hashish, would regularly approach the Moroccans, a jaunty, red-headed woman who was married to the American writer who could be seen during the day, walking along the cliffs, notebook in hand. “Jeannie,” as Jane Bowles was called, was intrigued by Moroccan women, and they by her; the Riffian women would long debate if she had earned her nickname because of her love of gin, or because she had seen the djinn. Witty, Arabic-speaking, and an excellent mimic—mimicry is a valued talent in Tangier—Jeannie became close to the neighborhood women. Souad, Yema’s sister-in-law, would go on to become Paul Bowles’s housekeeper for many years. Despite the myth of Tangier as a “dream city,” during the international era, the city’s native population was essentially stateless, consigned to impoverished, segregated neighborhoods. Locals sought rights and protection from the myriad consulates in the city. Hamadi, my grandfather, became a Spanish citizen. Eventually he founded Hispamaroc, the travel agency next to the Hotel Rembrandt, and in 1951 opened a restaurant, Hamadi’s, which remains the longest-standing restaurant in Tangier. Yema, in turn, became the community conciliator, power broker, money-handler, and the guardian of our memory. She prevented marriage disputes from escalating, and made sure no fatherless children in the clan went hungry. Her prestige fed my grandfather’s reputation, and vice versa. After Morocco gained its independence from France in 1956, it was agreed that Tangier would be handed over to the Moroccan government—now under the suzerainty of Mohammed V—over the next few years. Hamadi gathered his children around the tayfor—the low table around which we eat—and tore up his Spanish passport, “We’re now Moroccan.” Compensation came quickly. After independence in 1956, the king cracked down on the Rif, using napalm and leaving 10,000 dead. Protests turned violent. In early 1959, the Moroccan air force began bombing the Rif. Claiming that the intifada was coordinated by Abdelkrim in Cairo with the backing of Nasser—and seeing the recent overthrow of the Egyptian and Iraqi monarchs—the Moroccan army responded brutally with a scorched-earth policy. Led by then–Crown Prince Hassan, the military cracked down in 1959, using napalm and burning homes and wheat fields, leaving 10,000 people dead. Photographs show the diminutive prince strutting through the razed villages in a striped shirt and velvet vest, grinning, a rifle on his shoulder. 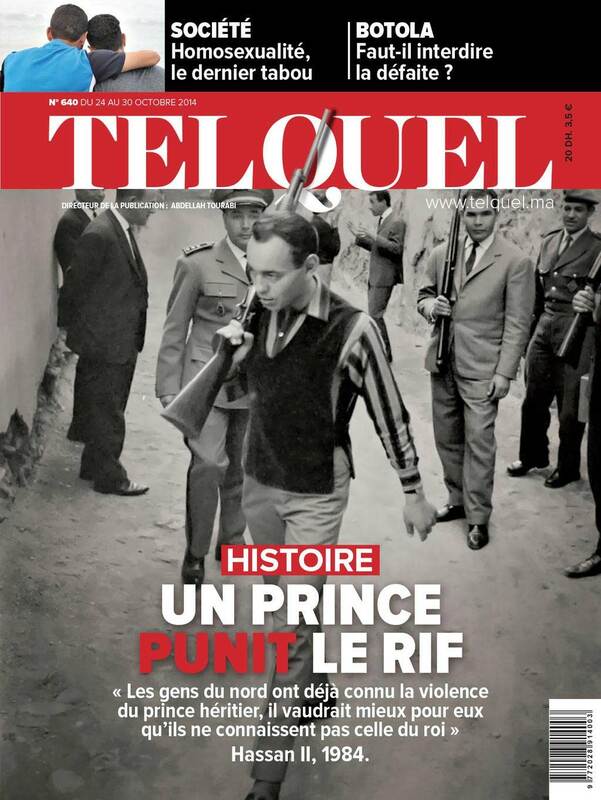 An October 2014 issue of Tel Quel magazine shows Crown Prince Hassan in the Rif in January 1959, after the Moroccan military’s suppression of the Berbers. In 1960, King Mohammed traveled to Cairo to reconcile with Abdelkrim, addressing him as “father” and inviting him to return to Morocco. Yet the monarch died soon after, and upon coming to power in 1961, his son, King Hassan II, would ally himself with the United States and against the Soviet Union and its “radical” Arab allies like Egypt and Syria. He issued a new Constitution, which Abdelkrim promptly criticized as having no “democratic contours.” Hassan then began a policy of isolating and economically strangling the north, moving diplomatic missions and airline offices from Tangier to Casablanca and Rabat, steering tourism and investment toward the south and depleting an already impoverished region. Tens of thousands of Riffian men migrated to Belgium, France, and Holland. As children, we never understood what we—as a people—were being punished for. In July 1999, Mohammed VI, the son of Hassan, ascended to the throne and began a policy of reconciliation with Tangier and the Rif region. The disaffection in the formerly Spanish north—by then a noted hub of cannabis production and Islamist activity—and the impasse in the Western Sahara, also a former Spanish territory, had become an embarrassment for the regime. From the 1960s onward, the regime had mobilized Islamism against Berber nationalism and leftist movements, but by the late 1990s, state officials were losing control of Islamist movements, which were now openly challenging the throne. Berber nationalism came to be seen as a way to offset Islamism. Abderrahman Youssoufi, a prominent Riffian dissident whose brother had been disappeared by Franco, was appointed prime minister in 1998. Mohammed Choukri’s acclaimed memoir, For Bread Alone, describing his escape from the Rif to Tangier in the 1940s, which had been banned in 1983, was reissued in 2000. Amazigh, meaning “free person,” officially replaced “Berber” as the preferred term in public discourse. The Royal Institute of Amazigh Culture was founded. Books began appearing about the north’s “embargoed history,” and magazines ran spreads about the “women warriors” of the Rif. And in January 2004, the regime launched an Equity and Reconciliation Commission to investigate human rights abuses that occurred in the northeast—and in other parts of the kingdom—during Hassan II’s rule. 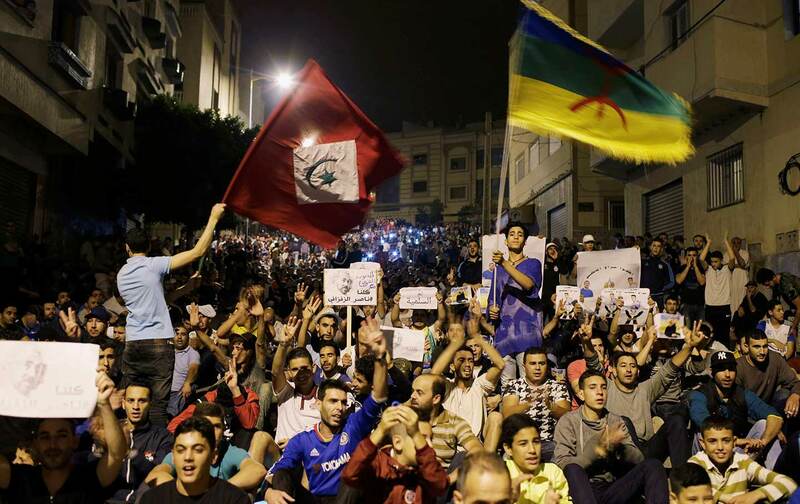 In 2011, protests erupted in the Rif again—though this time, activists liaised with counterparts across the kingdom. The cultural volte-face has indeed been astonishing. Nowadays driving through Morocco, one sees Tifinagh script (the Tamazigh alphabet) on highway signs, banners, and government buildings. Amazigh first names—Tilila, Kahina, Ayur—once frowned upon, if not banned, are now fashionable among middle-class Moroccans. (Those of us born in the 1970s and ’80s were given Egyptian names—Hisham, Rania, Amr—reflecting our parents’ orientation back then.) Amazigh cultural festivals are now organized around the country. Most striking, perhaps, is the resurrection of Abdelkrim, now extolled as a Moroccan hero who fought Spanish and French imperialism. Walking through Tangier’s street markets, one sees his visage on scarves, T-shirts, and keychains. Cap Radio, in its Tarifit broadcasts, plays chaabi and rap songs praising the leader. “Rif-Hop” is now a genre. Abdelkrim’s daughters have become minor celebrities, touring the country speaking about exile and reconciliation. The Riffian revolutionary is slowly becoming a cultural icon, an emblem of an alternative Morocco. The more militant protesters also demand the return of Abdelkrim’s remains from Cairo, and his commemoration as an Amazigh democratic figure, not just an anti-colonial symbol. Over the past year, violence has almost always erupted when protesters attempt to plant the flag of the Rif Republic on a building and the police intervene. While the pan-Berber tricoleur is seen across the country, the (Ottoman-inspired) red Riffian flag, with its crescent and six-point star, remains a point of acute contention: The head of the Moroccan socialist party says the flag should be integrated into national identity; other politicians see it as a sign of separatism and republicanism. But the popular image of the Riffian—long seen as a separatist, barely Islamic, green-eyed mix of African and Viking—is changing. Culturally and linguistically, the Rif since 1999 has been largely integrated into the kingdom. Moreover, the younger generation of Riffian leaders is politically savvy: Rather than speaking in Tamazight or Spanish, of indigenous rights and ethnic difference (as their elders may have), the hirak, as the activists are called, now issue their appeals in Arabic, demanding rights and services, and linking their movement to democratic struggles across the Arabic-speaking world. And their speeches tend to be laden with religious references as well. Holding a Quran in one hand and flanked by portraits of Abdelkrim, Zafzafi will speak of the Berber ancestors Masinissia and Jugurtha, the kings of Numidia, and the wisdom of the Prophet’s companions. In fact, it was his mosque speech challenging the government’s control of religious institutions—an issue that resonates broadly—that elicited the current crackdown. These days protests will erupt in Hoceima or Nador in the north, and quickly spread to southern cities, where a solidarity chant will rise, “Wlad al Rif mashi awbash!” (The children of the Rif are not awbash) and “Are you a government or a gang?” The Rif has become the epicenter and impetus for political protest in Morocco. Yema never learned how to read, not Arabic or any other language. She loved television shows on ocean life, and was a longtime fan of Jacques Cousteau’s Undersea World series. So in primary school, I would check out books on sea life and read to her. I’d point to different creatures and say the name in English or French, then ask her how to say it in Berber. She’d pause and utter some word, gijdoor or bibet. I’d look up at her. Her green eyes would light up—she was making up the words. Who on earth knows how to say “humpback whale” in Berber? Yema was tender. Her apron pocket contained an infinite number of coins, nuts, and Smarties, the British M&Ms. When the cold Atlantic winds started blowing in November, she would press her lips against our foreheads to see if we had a temperature. But she had a hard, unsentimental side. In Tangier, conversations tend to begin with a swell of nostalgia: how the city is deteriorating, overrun, not what it used to be. I never heard Yema express an iota of nostalgia, not for the Rif, not for the International Zone, not for the Italianate villas on the boulevard that were being razed and replaced by hideous high-rises. When I was a boy, every September a large burlap sack of almonds would arrive at my grandparents’ house, a post-harvest remembrance from distant relatives in Ajdir. In recent years, the sack had dwindled to a parcel, yet Yema would still give everyone a handful of sweet, crispy nuts. That was for decades a recurring, if tenuous, link to our ancestral land. When Yema’s heart stopped beating on February 7, the Rif came flooding back. For the three days of mourning, octogenarians with hennaed beards and women with names like Titem and Achoucha came to pay condolences. My grandmother was buried in Sidi Amar cemetery overlooking the bay of Tangier. Her headstone faces northeast; Gibraltar and southern Spain to her left, and the Rif mountains to her right. Part of the Amazigh predicament has always been which way to face. Abdelkrim’s generation looked to the east—Cairo, then Mecca—for salvation; subsequent generations would turn to Spain and France, and then east again. Which direction should the living face? As long as Yema was alive, we didn’t have to decide. Editor’s note: The original post, which has been corrected, misidentified the French leader in Morocco during the Rif War. He was Philippe Pétain, not Henri (which was his first name, but he commonly went by the name Philippe), and he was commander in chief of French forces in Morocco, not colonial administrator.